Hiddush appealed to Defense Minister Lieberman, Chief of Staff Eizenkot and Chair of the Ministerial Committee for Ceremonies and Symbols - Culture Minister Regev, demanding that female soldiers be fully included in official state ceremonies, including the ceremonies for Yom HaShoah (Holocaust Remembrance Day) and Yom HaZikaron (Israeli Memorial Day). On Yom HaShoah and Yom HaZikaron, the IDF places honor guards at the official state ceremonies, among which there are no female soldiers. Hiddush appealed to the Minister of Defense, the Chief of Staff, and the Chair of the Ministerial Committee for Ceremonies and Symbols (the Minister of Culture), demanding the inclusion of female soldiers in positions of honor. It is precisely during these days, when undermining of the integration of women soldiers in official expressions of Israel's military establishment, even if symbolic, becomes ever more important. 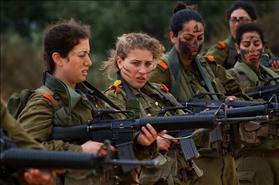 It must reflect the proportion of female soldiers as participants in Israel's military and combat efforts. Hiddush hopes that this inequality at state ceremonies would be immediately corrected and that the exclusion of female soldiers from the honor guard would be ceased immediately. Hiddush hopes that the failure to include women soldiers among the state's honor guard was an unintentional omission, done absentmindedly. Hiddush was very satisfied by the Defense Minister's own words on the subject, whereby he wrote that "the service of women in the military and their tremendous contribution to the IDF is very significant. Women have always had an impact on Israel's security, starting with the Prophetess Deborah, through Sarah Aharonsohn and Hannah Szenes, to the IDF and Border Police battalions of today." Hiddush hopes that the failure to include women soldiers among the state's honor guard was an unintentional omission, done absentmindedly. We are convinced that our request will be answered in the affirmative and that the Defense Minister's declared policy regarding the integration of women soldiers in Israel's fighting force will also receive its proper public expression in the state ceremonies that are planned for Yom HaShoah and Yom HaZikaron, as well as at all other state events at which an IDF honor guard participates.